"And I say to you, I have also decided to stick with love, for I know that love is ultimately the only answer to mankind's problems. (Yes) And I'm going to talk about it everywhere I go. I know it isn't popular to talk about it in some circles today. (No) And I'm not talking about emotional bosh when I talk about love; I'm talking about a strong, demanding love. (Yes) For I have seen too much hate. (Yes) I've seen too much hate on the faces of sheriffs in the South. (Yeah) I've seen hate on the faces of too many Klansmen and too many White Citizens Councilors in the South to want to hate, myself, because every time I see it, I know that it does something to their faces2 and their personalities, and I say to myself that hate is too great a burden to bear. (Yes, That’s right) I have decided to love. [applause] If you are seeking the highest good, I think you can find it through love." Dr. Martin Luther King, Jr., "Where Do We Go From Here?" Annual Report Delivered at the 11th Convention of the Southern Christian Leadership Conference, August 16, 1967, Atlanta, GA. The reason that Love is ultimately the only answer to mankind's problems is because Love comes from God. And what we need in this nation, my beloved, is God. 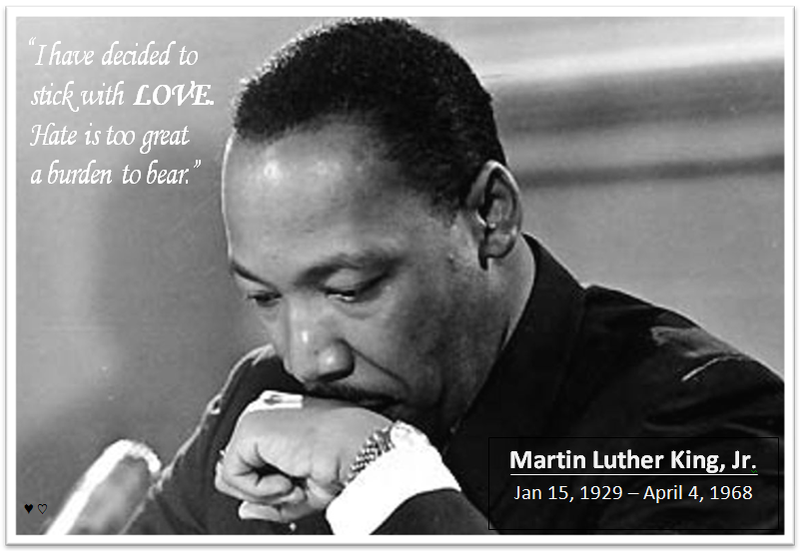 As Dr. King so powerfully portrayed in word and life, Justice and Love are Inextricably intertwined. That, too, is because both are a reflection of the character of our creator. Today is a celebration of the life and work of Dr. King, and this MLK Day shares with it a great American ceremony of freedom as we Inaugurate the 2nd term of the 44th President of the United States, Barack Hussein Obama. What a remarkable and wonderful testimony to the progress of our nation that black men went from the unspeakable horror of being the property of a slave owner, to this day where a black man is reelected as President of the greatest nation on Earth. Dr. King and other courageous souls presided over the tension of racial segregation and oppression, particularly in the South. He believed that the bank of justice was not bankrupt - and, lo, it is not! The progress between the bitter, violent, oppressive segregation of the 1960's and today is beautiful. But the need is still so great. And the need today is for Cultural Transformation, from the inside out.